Near surface high grade Cu in their 2007 drill program. 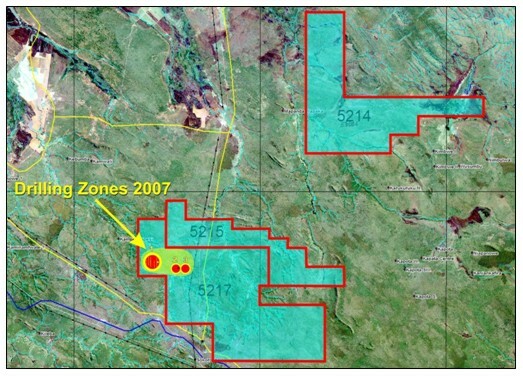 Significant geophysical targets delineated to be drill tested in 2008. Follow up drilling planned to start April 2008. February 1, 2008, Vancouver, BC -- El Niño Ventures Inc. ("El Niño") (TSX.V: ELN; OTCBB: ELNOF; Frankfurt: E7Q) is very pleased to announce initial analytical drill results from the recently completed 6200m reverse circulation drill program on its 70% owned Research Permit 5217 in the DRC Congo. Analyses were carried out by ALS CHEMEX, Johannesburg, S.A. Quality control procedures were strictly adhered to and included taking drill chip samples directly from the drill return by the project geologist , placing them in sealed bags and sending them directly to ALS Chemex in Johannesburg by air freight, who carried out the preparation and analysis. El Nino currently holds a 70 % interest in four well located Research Permits, accessible by road from the town of Lubumbashi in southern Congo. Each Permit is partially underlain by the highly prospective Roan Formation which hosts most of the important copper deposits in this area.. The accompanying map shows the general location of the licences, as well as the location of the known principal targets delineated on permit 5217 and the focus of the drilling to date. The Company has now received analytical results from three drill holes ANCU001, ANCU003, and ANCU004. (Values for ANCU002 are pending) completed during the 2007 drill campaign. Each of the three holes reported were drilled to a depth of 150m and inclined at -60o. These results are the first received from the 2007 drill program which targeted a copper anomaly, artisanal workings and remote sensing anomalies on Permit 5217. The results published in this release specifically relate to drilling on the copper showing and results relating to drilling on the other targets will be reported when received. 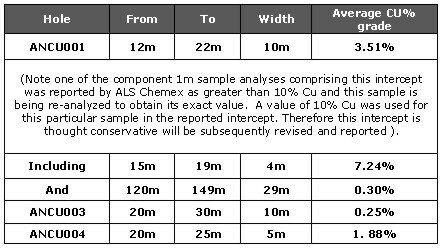 Significant copper intercepts in the three holes reported are as follows. Other results vary between 30 and 895 ppm Cu. Associated Co values are generally low (less than 1000 ppm). Jean Luc Roy, President of El Nino states, "We are very pleased with these results as they confirm the presence of near surface high grade copper zones on the Permit. Substantial follow up drilling, planned to commence in April after the rainy season, will test numerous high priority targets delineated on the Permit. The particular results reported come from our copper anomaly which is situated in the center of Permit 5217 along the southern edge of a major magnetic anomaly. Only four holes were completed in this area when drilling was stopped by the heavy rains, so we look forward to getting back to drilling off the mineralization in this area in April. Other results are expected over the next weeks and we will report these as they become available. In 2008 our drill program will test other areas within Permit 5217 and will also test geophysical targets identified on Permits 5214 and 5215." El Niño Ventures is a junior exploration company, whose corporate objective is to revisit former mining regions and apply the latest technologies to advanced stage exploration targets. El Niño has acquired a 70% interest in over 350 square kilometers in the world renowned Copper Belt in the Democratic Republic of Congo. In addition to our copper projects in the Congo, El Niño is currently in the middle of a 25,000 meter drill program on the Bathurst Mining Camp via an option/ joint venture agreement with Xstrata Zinc.